The Pittsburgh Steelers 2018 preseason opener against the Philadelphia Eagles not only ended in a win, it also included the team’s offense connecting on three explosive pass pass plays of which two resulted in touchdowns. 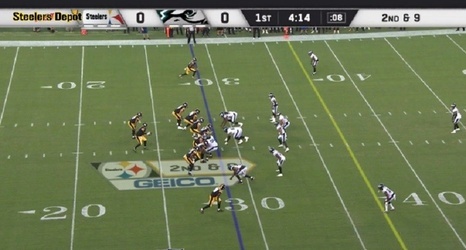 The first of those two explosive scoring plays came with 4:02 left in the first quarter when quarterback Landry Jones connected on a deep pass down the left side of the field with wide receiver JuJu Smith-Schuster for what ultimately resulted in a 71-yard completion and put the Steelers ahead 7-0. That play and ultimate score, however, was due mainly to Eagles defensive tackle Elijah Qualls jumping offsides prior to the football being snapped.